Do you often go to bed fantasizing about the NBA of the early and mid-2000s and wish you could see some of your players from your childhood grace the hardwood again? Do you wish that a professional 3-on-3 basketball league existed where these retired stars could flourish? I have good news for you, your dream is now a reality. 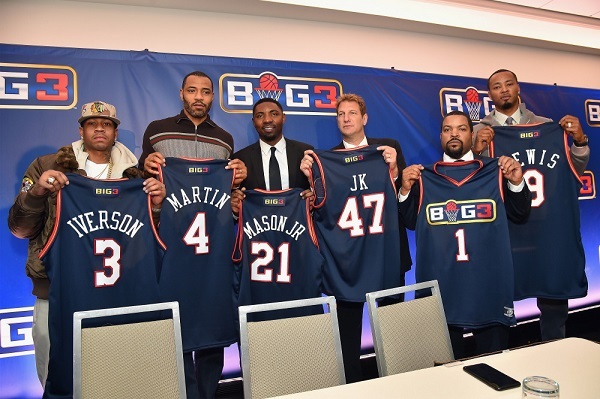 Entertainment mogul and newly minted Naismith Basketball Hall of Famer Allen Iverson along with Ice Cube have created the Big3 3-on-3 professional basketball league. Iverson will serve as a player/coach (very Bill Russell-esque) for the league which will help its marketability quite a bit. The eight teams involved with the league will be composed of former NBA stars and play an eight-week season starting June 24 and ending with two-weeks of playoffs. In classic 3-on-3 fashion, all games will be half court, games will also be up to 60 points and a 4-point shot is included in the rule book. Games will take place Saturdays in a different city each week and former NBA stars such as Rashard Lewis, Chauncey Billups and Kenyon Martin have signed on to play in the league while legends Gary Payton and George Gervin have signed on to coach. No word if this league will be televised or streamed in any way, but I am sure with the glutton on sports centric networks these days and the fact that the league wisely takes place right after the NBA season and in the middle of the dog days of summer, there will be some sort of network or service willing to televise it. It is a fun if not silly idea, and as a lover of 3-on-3 pickup basketball for years and a fan who grew up watching these guys play in the NBA, I will at least give it a chance.